Circa 1884. This inn is located in a restored hotel listed in the National Register of Historic Places. 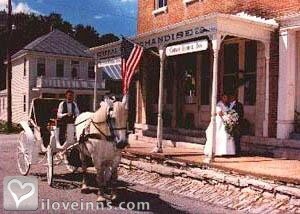 The inn originally served as both a hotel and saloon, but eventually served as a general store. 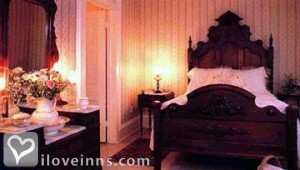 Rooms in the inn are named after prominent local citizens and include Victorian appointments and antiques. The Summer Kitchen, a rustic cottage, once served as a smoke house, bakery and kitchen for the hotel's earliest owners. 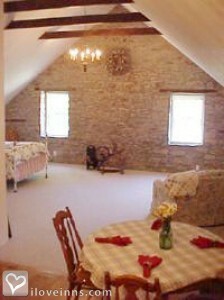 The cottage features original limestone walls and exposed beams. 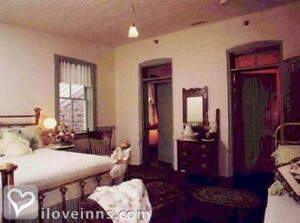 Another suite is also available in an 1859 rock house, and it includes two bedrooms. Breakfasts include entrees such as baked Victorian French toast, fresh fruit and homemade muffins or coffeecake.Publicity and Awards: Midwest Living, Midwest Motorist, St. Louis Magazine, St. Louis Post-Dispatch, Belleville News Democrat, Show Me St. Louis, KWMU-FM 90.1.Location: Country and In a valley in the Mississippi River Bluffs. Rooms: This property has 7 total guest accommodations, 6 with private bath, 1 with whirlpool, 3 suites, 1 cottage and 1 conference room. The types of beds available include Queen and Double. Amenities In Room: Hair Dryer, Air Conditioning, Wireless Internet Access, Restaurant and fresh flowers. Amenities On Site: Hot Tub/Jetted Tub, Gift Shop, Free parking on premise, Gift shop, Sweet Shoppe, Christmas and Antique shops. Business Traveler Amenities: Wireless Internet Access, FAX On-site and Daily Newspapers. Events Hosted: Honeymoons, Family Reunions, Seminars, Meetings, Weddings and Romantic Getaways. Other Activities: Antiquing, Fishing, Golf, Hiking, Live Theater, Wineries, Fults Hill Prairie Nature Preserve, Fort de Chartres Historic Site, Fort Kaskaskia Historic Site, Acorns Golf Course and Annbriar Golf Course.